When I say I’m finished with Acer, what I mean is I’m finished with the first draft of the third novel. We haven’t broken up. Acer and I will likely endure for a while yet, I hope. It all started coming together quite quickly in the end and I had a good gallop – a few late nights and early mornings – to the finish line. But I don’t think the ending is rushed. I think the book has a good pace all through. And then a man came through the door with a gun in his hand. I’ve moaned a bit about this book and how challenging it was to write for reasons that I won’t rehash here. I know that I’ve spent much longer on the Internet looking up this and that for this book than I have for any other I’ve written. For my own amusement I had a look at when I started writing it thinking that it must have been a loooonnnng time ago. I found a blog-post I wrote in February of this year where I said that I had the idea for books three and four in this series on my way to the airport. I did some maths and was amazed to calculate that this book has only taken me fourteen days to write to this stage. Then I double checked my figures and realised it was actually three months. (I’m an English teacher not a maths teacher.) That’s no longer than any of my other books time-wise. Books one and two in the series were both 100,000 words. This one is 91,000. The gentleman who helps me out with my writing ‘issues’ suggested a while back that I consider chapter length when writing. He probably said why, but I forget. I’m not a very good listener. It’s not easy to tell me something. Books one and two were both twenty-six chapters long. Book three is currently ninety-two chapters plus a prologue and an epilogue. That’s different. And here’s why. When I’d finished and was going through the file on the computer I thought that some of the chapters were a bit too long. And then I got to thinking how that seemed to make things drag in places when what I was looking for was a sense of pace. I cut those chapters in half. And it dawned on me that utilising something that has to go into a book anyway – chapter breaks – in the right way can be a convenient and legitimate tool for creating pace and tension. If I’d ever done a creative writing course, they probably would have taught that in the first week. And I realise that loads of others do it/did it: Chandler, Lee Child etc. I’m temporarily happy with the overall effect. I have it printed off and I’m now on stage two – going to town on it with various coloured highlighter pens. I don’t mind this part. I like getting surgical with it. If anyone ever asks me what’s the best thing about writing a book, I’ll answer: finishing it. If anyone ever asks me what’s the worst thing about writing a book, I’ll answer: finishing it. As a writer, the worst thing about finishing a book for me is that I have to start another one from scratch. The blank page/screen is waiting and it’s daunting. So here is a tip for myself that’s worked for me this time. Start another book before you finish the one you’re on. I started Booker & Cash#2 a while back with a good idea. I got to 20,000 words and had to put it to one side for R&M#4 and then Acer#3. Now I don’t have to start a new book from scratch. I’m already a quarter of the way in! Kerching! I had a nice surprise via Twitter this week that is worth recording for posterity here. I won’t go on about it. I’ll just paste the link. The link below provides some great ideas for those looking to get their Christmas shopping all finished early this year. 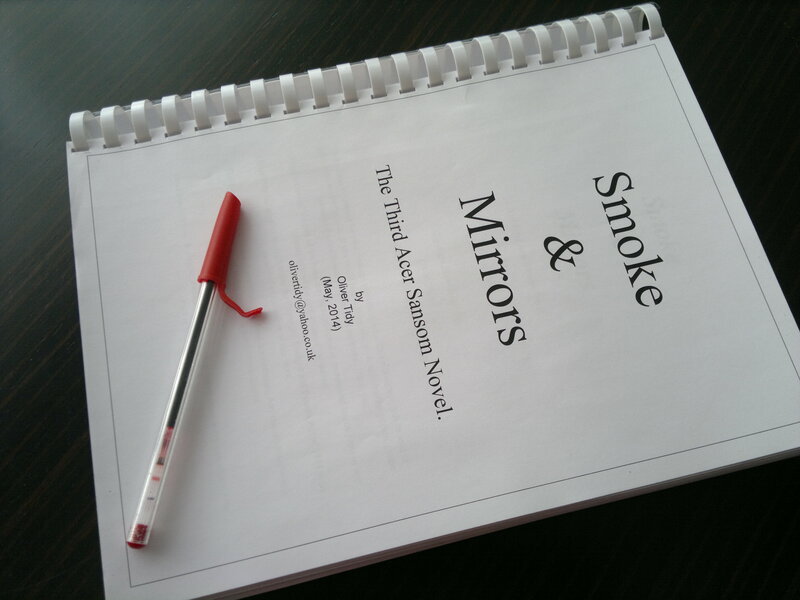 This entry was posted in Self-publishing and tagged Acer Sansom, e-books, self-publishing writing, Smoke & Mirrors, writing by olivertidy. Bookmark the permalink. Firstly, well done on getting a very nice book review. Secondly, I look forward to the release of Acer :). Keep up the good work Oliver. Thanks a lot. You must know by now that your continued interest and support is sincerely appreciated. Thanks for the kind words. I really appreciate, as fan of your work, the continued engagement and interact with us. The vast majority of authors don’t bother! The power of negative thought – my Acer computer (bought from Comet, need I say more, saga of disaster) was my first thought when reading your heading on the email sent to me. Whilst reading your blog my Asus screen died a sudden death. I am now hooked up to a little baby screen last used in 2004.
ps There is a riot brewing among the Hospice workers – Head Man is closing the Canterbury Hospice. Oh dear. I’m glad I didn’t call him ‘Dell’ Sansom. My laptop remains fine! (Touch wood.) I bet we all have a Comet story to tell and I’m not talking astro-physics. Closing the Hospice!! No. Surely not. I’m going online to check that out. As always, looking forward to another book from you. Thanks, Pat. Appreciated, as always. Hurrah, Yippee, Well done Oliver, how long before I can read it? Thanks, Chris. I’m hoping for a late June/early July publication date. I shall keep the blog updated with news. Really pleased for you Oliver for the great review, but even better news for me that the 3rd Acer novel is nearly finished. Thanks for stopping by with your very kind comment. Much appreciated. Well done Oliver, I await Acer with bated breath …….good that a competitor has written well about your books, but good for her too, as I have just purchased one of hers!!! Hi Oliver, and a good morning from a cold, damp Dover. Congratulations on the review. Anyone who appreciates your books is okay by me, so I have downloaded the first of Frances’ books. As soon as I have finished the latest Peter James, (ROY GRACE series, set in Brighton), I shall be straight into it. Well done on finishing the latest Acer, and I fully concur on the chapter length issue. I have always found shorter chapters much easier, and more convenient. You can keep Dover’s weather. Bright sunshine and hot with it here. Shorts and T-shirts all the way from now on I think. Thanks for your good wishes. Much appreciated. I am now in contact with Frances so I’ll pass on that she’s got another download out of her review. It’ll be interesting to see how the shorter chapter lengths are received on this one. I must say I prefer reading books with short chapters because of the opportunities to finish reading for the night on a proper break.